Experiencing Italian Village with Mom. Since Mother's Day is this week, I decided to invite my mom to visit Italian Village (5370 S. 900 East, 801-266-4182) with me for this article. I thought we'd order up some pasta, critique the place together and have a few laughs—which we did, of course. However, when I booked this pre-Mother's Day get together, I was unaware that this very same Italian Village was a spot frequented by my parents when they were first married. "We would have a few Cokes, eat pizza, and it was divine," she says. Discussing the restaurant's role in my parents' early years led to the familial revelation that pizza at the Italian Village was the last thing my mom ate before going into labor with all three of my older brothers. "Not you, though," she says, "You are my Astro Burger baby." Even on a Sunday night the place is packed. Based on its location and its staying power, the Italian Village draws a pretty huge crowd of Murray and Midvale locals who no doubt like the place because of its straightforward menu, reasonable prices and ample parking. It also has the feel of a dining establishment that loves its community—owner Shay Bloomquist takes the time to respond to each and every Yelp and Facebook review that comes along. According to my mom, the place has always had a laid back, family-friendly kind of vibe. Since pizza with pepperoni, mushrooms and black olives was the pie that officially kick-started my lineage, it made sense to start with a few pizza combos. Mom got pizza and spaghetti with meat sauce ($10.59) and I got pizza and lasagna ($10.79), with a side of chicken Parmesan ($4.99). While we waited for our food to arrive, Mom and I talked about the lay of the land; apparently a lot has changed since the restaurant opened in 1968. The booth at which we sat had been retrofitted with high partitions that attempted a sense of quasi-intimacy. Along with these furniture changes, the floors and light fixtures also seemed redone, making the whole space look as if it was built within the past five years or so. The pizza combos are a great way to sample what Italian Village has to offer. Although the restaurant has bigger pizza sizes, the 8-inch pie with a skillet of lasagna or plate of spaghetti is a great way to carbo-load. "It still tastes the way I remember," Mom says. "It's the crust that always gets me." I have to agree with my mom here. The veggie toppings don't appear to have been cooked with the pizza—they tasted fresh, and it's pretty clear that they've been sprinkled on top after the pizza came out of the oven. The crust is tasty as hell. It has a bit of char from the oven, and it's slightly thinner than average, which gives it a pleasantly chewy consistency. Overall, Italian Village's pizza game is solid. They're not the best pie joint in town, but great for families looking for the shared experience that gathering around a few gigantic pies at a local restaurant can offer. Things get a little trickier with the pasta. I like a lasagna that comes served like a slice of layer cake—I want to see a cross-section of meat, cheese, noodles and sauce in a five-inch tall slice that wobbles ever so slightly as it's brought to the table. 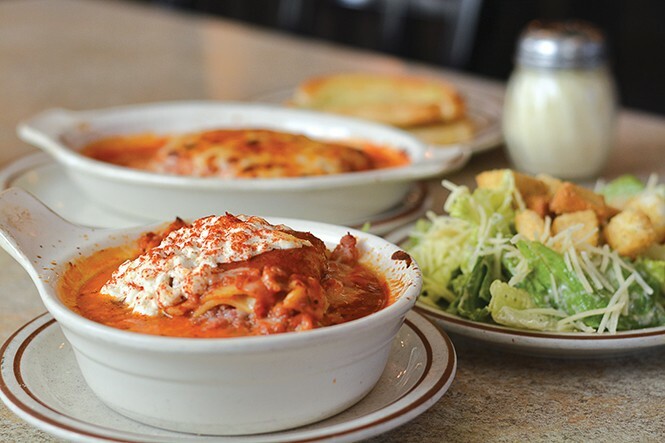 The lasagna at Italian Village comes served in a searing hot ramekin, drowned in soupy tomato sauce and topped with a dollop of cottage cheese. I have nothing against any of these things on principle; but the presentation factor was a bit muted. Flavor-wise, the lasagna delivers. It's meaty and cheesy, though perhaps a bit over-salted—I think my mom's lasagna might edge it out. "You're full of it," she replies to my opining. "But that's nice of you to say." The side of chicken Parmesan was the dark horse of the evening—it's a surprisingly tender and juicy piece of breaded and fried chicken buried in a hearty mixture of marinara sauce and a few inches of melted cheese. They sprinkle a little paprika on the top, which imparts a smoky tang that ties all the flavors together nicely. If you plan on venturing off the pizza side of the menu, this is where I'd suggest you start. A few Cokes and pizzas dispatched, Mom and I start to wind down a bit. We box up what's left of our pizza for my dad—"He'll like the bit of nostalgia," Mom says. Despite a few menu missteps, eating at Italian Village with my mom and learning about the role it played in my parents' first years of marriage was a fantastic bonding experience. I suppose being able to wax nostalgic with the woman who brought me into the world transcends a few off-kilter pasta dishes.